Italy's Dispute with Abyssinia and recent Nazi moves to condition reentrance into the League of Nations on recognition of Germany's right to acquire colonies reflect the growing power of expansionist sentiment, in Italy and Germany. 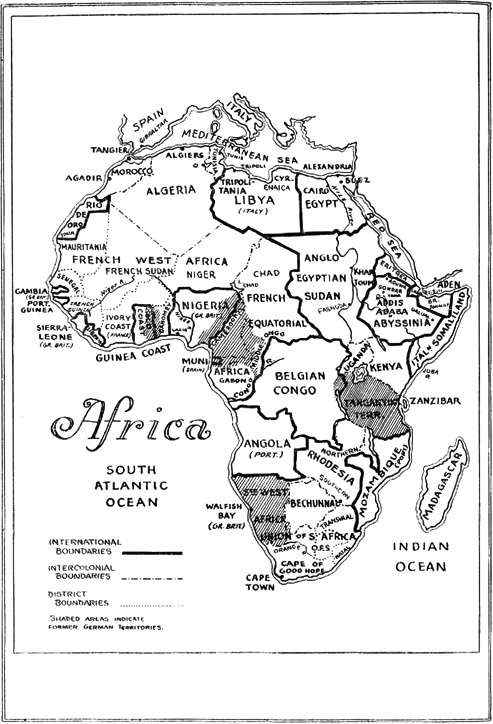 In the 40 years preceding the World War, almost the whole of Africa was partitioned off by the powers of Europe, but in 1914 neither Italy nor Germany looked upon her colonial empire as sufficiently extensive to meet the demands of economic need or national prestige. Germany under the Versailles treaty was deprived of all of her colonies, while Italy considered as an unsatisfactory liquidation of her claims the territory she gained as a consequence of her entrance into the war on the side of the Allies. The manifest desire of both countries for colonial expansion suggests the likelihood at some future date of a realignment—voluntary or otherwise—of colonial boundaries in Africa. As a result of action taken by the League Council on May 25, the Italo-Abyssinian dispute, which began last December with an engagement at Ualual between Italian and Ethiopian troops, is to be arbitrated in conformity with the Italo-Abyssinian treaty of 1928. Resolutions adopted at Geneva provide for the submission of the claims of the two countries to a commission composed of two representatives of each of the disputants.